Solomon, Barbara Miller. 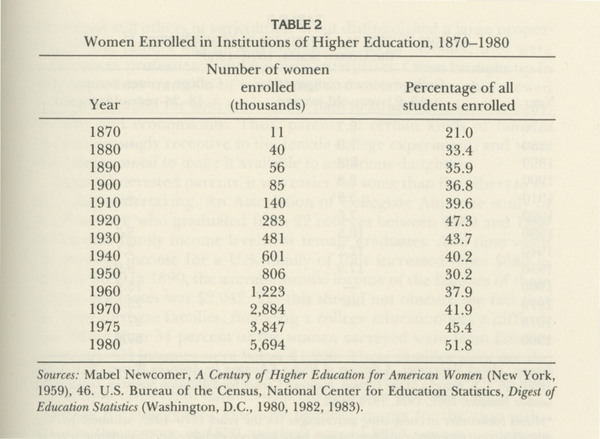 “Women Enrolled in Institutions of Higher Education, 1870-1980.” From In the Company of Educated Women: A History of Women and Higher Education in America. New Haven, CT: Yale University Press, 1985. Solomon, Barbara Miller, “Women Enrolled in Institutions of Higher Education, 1870 - 1980,” The Albert M. Greenfield Digital Center for the History of Women's Education, accessed April 26, 2019, http://greenfield.brynmawr.edu/items/show/1493.